Shooting began in April of 2002 at the Grand Opening of the International Bluegrass Museum in Owensboro, KY. Additional footage was shot on location in the buses of the pioneers, at their homes and backstage at bluegrass festivals across the US. Release date: July 22, 2013; run time: 84 minutes. Click here to listen in on a radio interview about “Making History with Pioneers of Bluegrass” that aired 7/14/13 from WRLN’s “Folk & Acoustic Music Program” hosted by Michael Stock. Read reviews and other media coverage! Check out quotes from the movie! In early 2002, I was sitting in my office in Brooklyn and realized what a loss the bluegrass community had suffered recently with the deaths of so many legends like Benny Martin, Pappy Sherrill, Jimmy Stoneman, John Hartford, and Bill Napier to name a few. I remember saying to my partner, Tina, “It’s a shame that all of these pioneers of bluegrass music are passing away and their stories may never be told.” And we got to thinking about all the unsung heroes of bluegrass that have died, with barely a ripple in music circles. What stories would they have told about the early days, about the big name stars, about their love of this music? So we thought it would be amazing to be able to talk to these remaining pioneers and share their thoughts and insights with future generations. Everyone who truly loves this music should want to hear the stories from not just the big names in our business but from the likes of Bill Yates, Art Stamper, Melvin Goins, and Kenny Baker…words preserved now in this documentary, honoring their legacy. 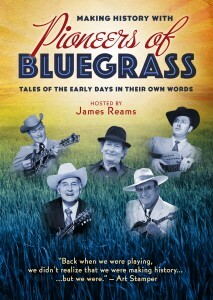 “Making History with Pioneers of Bluegrass” proves that their lives are no less important to how bluegrass got started than the major stars. If you want to hear stories from the heart, captured by a fan and fellow musician, this is a great place to begin.